Browse significant results in current research areas. Courses taught by Professor Basu. Meet Professor Basu's grad students. Professor Basu is a Professor of Mechanical Engineering and the Associate Division Head of the Division of Materials Science at Boston University. He received his Ph.D. in Materials Science from MIT in 1989. 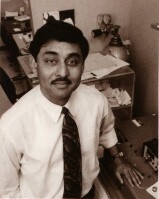 Professor Basu is a member of the Photonics Center at Boston University. Professor Basu conducts research and teaches both undergraduate and graduate courses in the area of Materials. Dr. Basu's research investigates the effects of processing on the structure and properties of environmental barrier and thermal barrier coatings, and photonic and electronic thin films. Of special interest is the study of the evolution of microstructure and defects in these materials, as well as the interfacial structure and stability of these coatings and thin films using electron microscopy techniques. Another area of research involves the study of degradation of materials at elevated temperatures in corrosive environments. Contact Professor Basu. For questions or comments about website, contact webmaster.